“Who would like peaches?” a friend posted on Facebook. “Yes please,” I answered, not being one to say no to abundance. Within hours her husband had delivered a plastic shopping bag completely full of peaches. The bag was just a small portion of the harvest from their tree. Home grown peaches are different to store ones. They don’t look as pretty – more greenish than orange – and are smaller and often they have blemished skins. But my, the taste is soooo good. 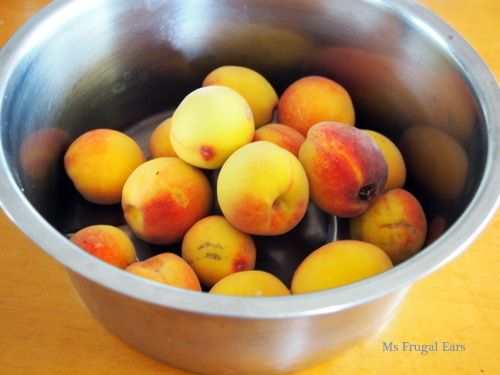 I took a smaller box of peaches with me around to visit friends for Australia Day. The hostess cut them up into pretty slices and arranged them, lotus like, on a plate. I was amazed at how sweet they were. I don’t know the truth or otherwise to that (and I should add that fruit trees are not his academic specialty) but I do know that these small, seemingly imperfect peaches tasted pretty damn good. And because I inherited so many, I made chutney. This chutney is just delicious on a piece of cheddar cheese, and also with ham or other meats in a sandwich. It transforms cheese toasties to something magical. I was wondering as I made this whether or not I had totally lost the plot. It took around 20 minutes or so (probably longer) to chop the peaches and prepare the ingredients. Then over an hour in the breadmaker (I like using this machine for jams and chutneys as I can set and forget). 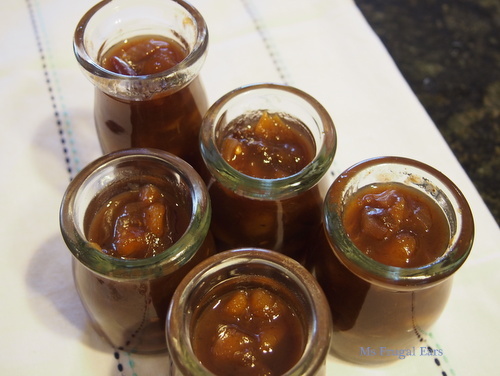 Not wanting to waste anything, I was picking through the peaches that had gotten squished at the bottom of the bag and cutting out the good bits for the chutney. Would I be better to just hang it all and go to the movies or chill and watch TV instead? 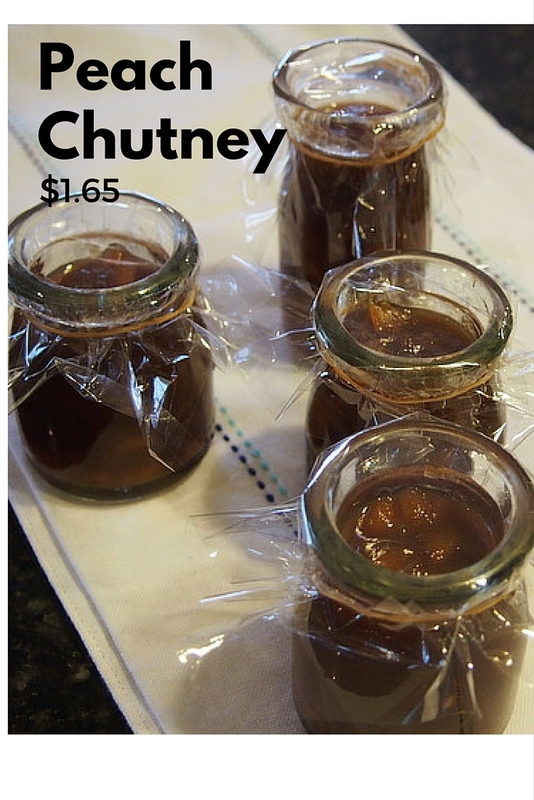 Surely it only costs a few dollars to buy chutney? But ah, the joy of homemade. The joy of being able to gift handmade to people in my life rather than just buy ‘stuff’. And for me, the joy of cooking. It was fun to sit and do this. And also, the joy of using things up. 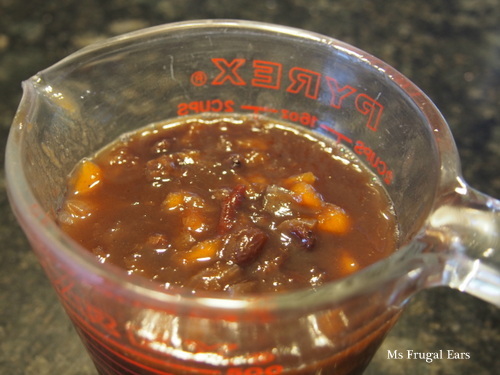 This recipe allowed me to indulge in my #useitup quest, which will be theme for my blog posts this month. I was able to use up sultanas and some spices (I somehow ended up with masses of cardamon pods). You can substitute whatever spices you have lurking in your spice drawer. Spices are best fresh so #useitup any that are a bit dated. 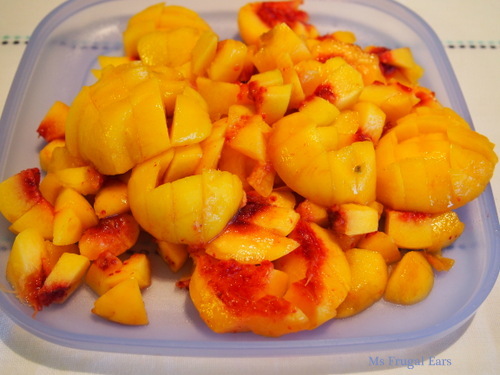 I made this recipe with peaches, but when I lived in Queensland I used to use mangos. You could also substitute other fruit such as nectarines, apples, feijoa, fig or pretty much anything you want. Place all ingredients into a breadmaker and switch on the jam cycle. This should take at least an hour. If you don’t have a breadmaker, put the ingredients into a saucepan and cook over a low to medium heat for around 40 to 45 minutes. I find it generally works better if you make a larger quantity if you are cooking over the stove – you can double or even quadruple the recipe. Spoon into steralized jars and seal. Yum, brings back happy childhood memories growing up on a peach orchard. Shop bought peaches have never been the same. We also use our bread maker for things like jams etc. What do use your chutney for? Wow, you grew up on a peach orchard? Yes, shop bought are not the same. Don’t smell the same and don’t taste the same. I like this chutney with cheddar cheese in toasted sandwiches.